This is a very wise standpoint in life for individuals even, to focus on your calling and to be what you are good at. Not staying at the surface with the knowledge of many things, but to hone your talents in one arena and be King of that. Much like Google has become King of the Internet Search Engines. Google seems called to to do this, they are great at it, very passionate, and they focused on the search, aspects of the search, and what other ideas that work hand in hand, together to enhance the search engine process. Google has many services, all connected to help create and add to their massive search capabilities. Ideas that work alongside the search engine foundation. While Google Lively was an incredible project, this site was a bit separated and removed from the rest of the mass of services as it did not enhance or flavor the prime focus of the search engine. It was more of a stand alone “new deal”. Let’s get a visual with this and say I have an intense set of Lego blocks and then I get this equally great set of KNex blocks (while each set is brilliant by itself, working together is a bit difficult, not impossible, but difficult). Having two Lego block sets or two KNex blocks sets will create many clever things, but all working together, built from the same core material, and acting to enhance the whole. Google is staying with the one type of block and focusing it’s energies to relate to (first and foremost) the search engine. To feed the master program with even more relevant terms, perfecting and enhancing it’s service to the Internet. Google has specific search engines like a blog search, book search, news search, and patent search to assist in the faster location of individuals needs by sifting into categories to weed through the unnecessary items even before the search begins. Google Groups area allows a space for users to create a site for like minded individuals or to join in discussions with groups already formed. There is literally a group formed on almost every topic imaginable, over a million separate groups for you to meet other group members. Google Video and YouTube are Google’s video search and hold areas for users to upload, view, and share video entertainment of all types. Again, the specific search engine strictly for video is available through the main site. Google has even created an area where all users can invent their own search engine! Design which sites are to be searched through your own search engine. This is most handy for organizations, groups, and especially for learning facilities or parents who would like the students to be able to use a proper search engine, but wish to regulate which sites or search terms are able to be located. There is a Calendar, photos with Picasa, Google Docs for documents and presentations, Google Reader for your blogs and social networks and other sites for bookmarking, and iGoogle to keep your information all together on one site. To access the entire listing of all the services is quite easy, along the top right hand side of the Google site there is a listing of Web, Images, Maps, etc. The last link is “more” with a dropdown menu and another list ending with “even more”. Click on that to visit the entire list of services page. This huge hub page of holds the active services and the testing ideas as well under “Labs”. Visiting the Google Labs section is quite interesting and a whole lot of fun. This allows it’s visitors to “play” with it’s newest designs before they are released as a set in stone service. Some of the recent graduates of the Labs are very handy. Suggest is the newest search feature where Google gives suggestions while you type in a search term or keyword in the form of a dropdown as you type into the search bar. This addition gives you a shortcut to longer search terms and also may expand on your original ideas to take you where you need to be faster. Google Transit is another recent graduate of the Labs to allow users to become much more acquainted with the public transportation in their cities and areas. Many people would like to use the public systems in the towns and have no idea where to begin. Transit is your answer. GOOG411 is Google’s over the phone search for local businesses. Yet another free service to search for businesses in your area, but this time through the phone lines. Chrome has been release from the Labs earlier than expected and is Google’s Browser extraordinaire. A free browser for Windows Vista/XP SP2. Chrome is a browser that combines a very simple design paired with Google technology to make the web safer, faster, and easier with an all in one box system. The instructional videos here on the Chrome page will get you ready in no time and gain you a thorough understanding of the newest service, the Chrome web browser. From the Blogger updates of import and export abilities along with the future posting and newest additions of Reactions and other Google gadgets, to the management of your health files all in one place with Google Health, I would be surprised if you were searching for holding, filing, searching, or collection answers, that one of Google’s Services would not complete the puzzle for you. If you are looking for some unique, very cool HTML comments and graphics, Sparkle Tags will have just that. An outstanding choice of Military comments, generators, backgrounds, music skins, contact tables, and network banners along with Sparkle Tags videos and a host of great layouts. The fluttering butterfly graphics are very nice and hands down a winner. Sparkle Tags is also quite compatible with the Ning blog social networks, Hi 5, MySpace, Live Journal, and Friendster. They also have a free download toolbar for hot news, top links, online radio, fun gadgets, and a Google Search. Kudos to FreeWebs and its site! Technorati isn’t as geared towards friending as it is favoriting Blog Sites. At Digg both are featured. Google Powered Search Engine, TV Nut, Make A Video Email, Business Help, Games, Free Advertising and Much Much More! This is one of the greatest toolsites to go along with the other tools you currently use now. Has anyone even noticed the amount of Social Network Outages lately? Is everyone doing updates at the same time, during the same two weeks? MyBlogLog? Utterz? Hi 5? PageSwirl? Facebook? Wetpaint? Pownce? and More? Yes, we all have experienced the daily Twitter glitches from too many Tweets at a time, but…. There is an awful lot of sites going down for a bit and taking a vacation of sorts to regroup, don’t you think? I am not one to guess or anticipate the reason why these sites are all updating during the same time frame, but… hmmmm… Quite curious I think… Are we experiencing droves of newcomers to the Social Networking World and the sites need to take a breath to catch up? Or are we all getting set up for bigger and better things ahead? I will keep in touch with this topic and find out more. Look at the excitement at Shelfari! The easier the better! Mixx was set up, posting new links, and “Mixxing” within minutes! I saw a link on CNN on the article for Google Earth on Mapping out Disney for everyone and coolies! What an easy to navigate fun site for “1 upping” and Mixx This! It is the same principle as sites like Digg, is one of the easiest sites yet I have put together and navigated. (Although, I am taking into account that I may just be getting quicker but not in this case 😉 Anyone can get around here at Mixx.com If you like the favoriting systems and sites out there, then you are going to get into Mixx. The groups at Mixx will get you connected fast to cool friends with like interests, so get on board at Mixx today. Bebo is a fun clever social network and has a “taste” of other social networks melded into the scope of Bebo. The site tracker is a very neat tool that automatically is part of your Bebo home page. Get a look at where your visitors are coming from by clicking on “Who Visited My Profile?” Bebo has a taste of WordPress, Site Meter, or Google Analytics right on the home page. They also have a Twitter like function of a blurb, bubble, or thought box as well. Add your random daily thoughts in a micro blog way here. Adding photos, videos, and apps is easy here at Bebo, which reminds me a bit of MySpace and Facebook. To get a taste of Wetpaint add the app of the whiteboard. It is kind of like the wetpaint Paint Splatters where you create a vison on the board for yourself and your friends with a Bebo flair. Writing stories reminds me of the coolness at Live Journal too. For the bloggers who have a page at Bebo, get writing! Onto Zonzia Dot net! Directly to to the upper left side of the home site, there are 3 links to Site Tour, Site Help, and Success Stories that I recommend highly for just basic navigation and getting to know the site. I found the initial “set-up” process extremely quick and easy. The navigation links are all laid out to “make sense” so are fast to find, and a breeze to get around. Zonzia is a dating and friendship site geared towards showing you and others what steps to take next in order to meet quality potential dating relationships online. The tips and advice available look quite promising for the single professional on the internet today. 24 hours a day you’ll find a community of friendly singles hanging out in our Chat Room. 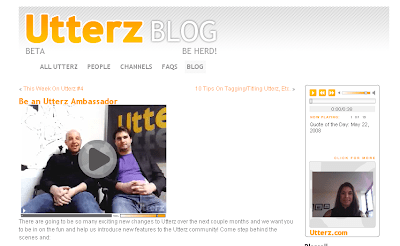 “We are excited to announce the Utterz Ambassador Program. Holy Cow! Utterz is getting ready for some ground breaking status symbols! The Utterz Ambassador Program! If you are into Utterz, let them know right away by visiting their blog below that you would like to be considered for the Ambassador Program at Utterz! What a cool site this one is guys! Utterz is an awesome social networks system that allows you to post from your cell phone, so the ease of use is in the bag! Post photos, text, Video, Audio, theres Widgets for your blogs, and step by step instructions! Connect to Pownce, Blogspot, WordPress, Typepad, Flickr, Youtube, Twitxr, MetaWeblog, Twitter, Live Journal, and much more! One of the neatest features is with each post you can have an audio, text, video, and photo in the same Utterz! All ways of communication rolled into one neatly configured post! What a brilliant story in the SFGate! About Mena Trott in labor for 32 hours and keeping her friends and fans updated through her blogging! She used her cell to post pictures from the hospital and get up to the minute news of the miracle of the birth of her new bundle of joy!